We design and provide intelligent turn-key supply chain, reverse logistics and sustainability solutions and digital platforms. Our design and management expertise spans across supply chain, logistics, product stewardship, product lifecycle management and recovery, sustainability and digital technology. Over 20 years of supply chain and reverse logistics expertise. We understand what it takes to scale your business operations, drive efficiencies where required and introduce new innovative processes and technologies to make it all happen. 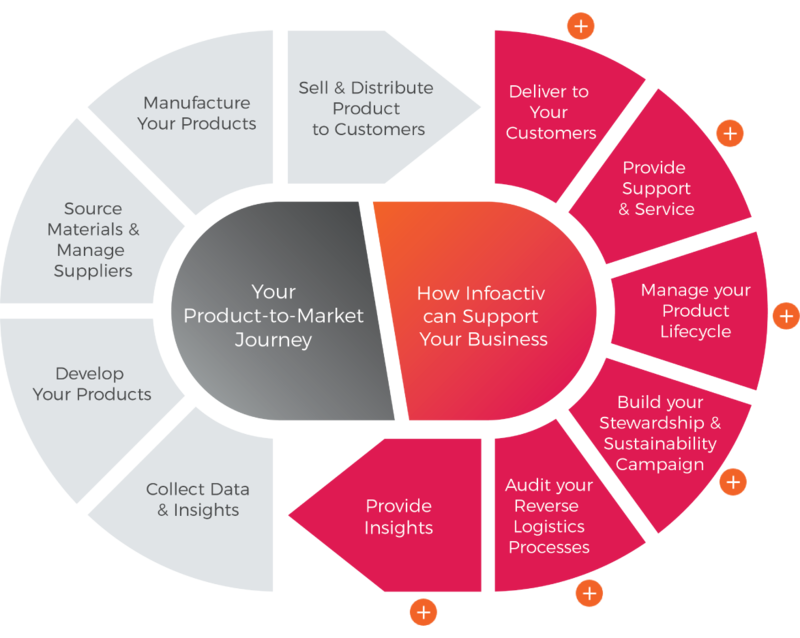 Infoactiv provides significant expertise and end-to-end service capability, from pre-sale activity through the product life cycle, to end-of-life requirements and resource recovery. Our team is dedicated to designing and adapting real-time solutions that fit your needs, to help you achieve your bigger business goal. We understand the challenges in taking a product to market and the missed opportunities in the customers’ journey. Infoactiv has a team of experienced solution consultants and the industry and technology know-how to customise end-to-end reverse supply logistics solutions. Data insights and analysis for improved product design, strategy, and operations. EcoActiv is a full-service recycling application for all unwanted household and business items. Users can book the disposition and recycling of their items through the platform for any location in Australia.